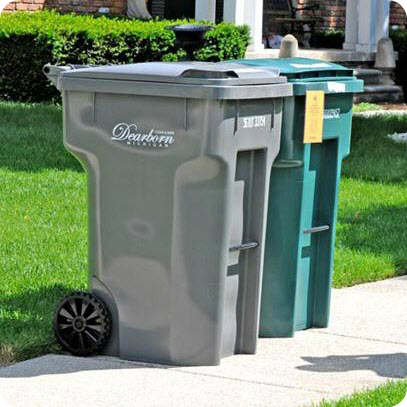 New City of Dearborn policy For Trash, Recycling and Yard Waste collection goes into effect on May 4th. Starting on May 4th, specific rule violations could cost the homeowner a minimum $75. The new policy states when the City contractors cannot complete trash collection at a home because of a rule violation, they will leave a notice to explain why. Any violating items not collected must be removed from the curb by midnight of the trash day by the resident, OR they may call the City for a special pickup. A minimum fee of $55 will apply. All violating items still found on the curb the next day will be collected without further notice and a minimum fee of $75 will be assess to the household in violation. All trash must be bagged and placed inside of city-issued gray carts. Trash in cardboard boxes will not be picked up. Curbside recycling using the city-issued green cart, is mandatory in Dearborn. Recycling pickup is every other week. Additional recycled items when recycle cart is full or items that will not fit in your recycle cart must be bundled or tied in manageable pieces so they can be collected. Yard waste must be in yard waste paper bags or personal 20 – 32 gallon containers clearly marked with a yard waste sticker. Bags and containers must weigh less than 35 pounds. Households are limited to a combined 20 yard waste paper bags, yard waste containers, or bundles of brush per week. Households are limited to 5 bulk items per week; a maximum of 20 per year. As an alternative to fee-based special pick-ups, residents with proof of Dearborn residency can bring acceptable items to the DPW Yard for disposal at no cost. The DPW Yard, 2951 Greenfield, is open 8 am – 1pm the third Saturday of each month. For Special Pick-up call 313-943-2433. A minimum fee of $55 will apply. To read more about the Trash, Recycling and Yard Waste collection policy please see the City of Dearborn website.